Amazonian forests harbor numerous plants of economic value (Balick, 1985; Farnsworth, 1984). In fact, intact Amazonian forests are often more valuable for their timber and nontimber products than are the agricultural plantations or pastures that too frequently replace them (Peters et al., 1989; Menezes, 1990). Moreover, Amazonian forests have inestimable value as reservoirs of biodiversity, regulators of hydrological cycles, protectors of fragile soils, and stabilizers of the atmosphere. Because of the value of Amazonian forests, those who wish to replace them with agriculture or pastures should be required to demonstrate that their projects will yield more than the value of the intact forests. One of the most important economic plants of the Amazon is the Brazil nut (Bertholletia excelsa, family Lecythidaceae). The edible seeds of this species, along with the latex of Hevea brasiliensis, are often cited as the most important products of extractive reserves in Amazonia. Brazil nuts are collected mostly during the wet season and rubber is tapped mostly during the dry season. The combination of these two forest products provides year-round income for those living by extractivism. Collection of the Brazil nuts and rubber has relatively little impact on the ecology of Amazonian forests. Therefore, it is often stated that conservation of biodiversity and exploitation for these and other nontimber products is compatible. However, those who gather nontimber forest products are almost always involved in other activities such as slash-and-burn agriculture, timber extraction, mining, and hunting. As a result heavily used extraction reserves usually protect only part of the vast biodiversity found in Amazonian forests. Consequently, any conservation plan for the Amazon must include large reserves of all Amazonian ecosystems that are protected from excessive economic exploitation. In this chapter, I review the natural history, the value of the Brazil nut harvest, the possibilities for plantation cultivation, and the future of the Brazil nut industry. Because of its economic importance, the Brazil nut has been the target of many studies of its biology and agronomy. The greatest number of these studies has been carried out under the auspices of the "Centro de Pesquisa Agropecuária do Trópico Umido" (CPATU) of the "Empresa Brasileira de Pesquisas Agropecuária" (EMBPRAPA) at Belém, Pará, Brazil. A bibliography of the Brazil nut with 259 titles is available (Vaz Pereira and Lima Costa, 1981), and a recent summary of Brazil nut biology and agronomy can be found in Mori and Prance (1990b). Bertholletia excelsa belongs to a pantropical family of trees (Lecythidaceae) that includes approximately 200 species in the Neotropics, distributed from southern Mexico into southern Brazil (Mori and Prance, 1990a; Prance and Mori, 1979). The Brazil nut represents a single species in the well-defined genus Bertholletia. Although there is considerable variation in fruit size and shape and number of seeds per fruit, there is no justification for recognizing more than one species of Bertholletia. 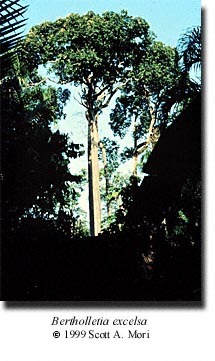 The closest relatives of B. excelsa are among species of Lecythis commonly referred to in the vernacular as the jarana group (Mori and Prance, 1990b). Other species with edible seeds in the family are Lecythis pisonis and its relatives, L. minor and L. ollaria. The latter two species, however, sometimes cause hair and fingernail loss because of excess selenium accumulation in the seeds (Dickson, 1969; Kerdel-Vegas, 1966). Nevertheless, the differences between Bertholletia and Lecythis are so great that there is little hope for introducing genetic material from one genus into the other via hybridization. Consequently, germ plasm for improvement of Brazil nut production will have to come from the variation found within B. excelsa, not from closely related species in other genera. Bertholletia excelsa is an Amazonian plant that prefers nonflooded forest (terra firma) in the Guianas, Colombia, Venezuela, Peru, Bolivia and Brazil. The climatic conditions under which Brazil nuts grow are summarized in de Almeida (1963), Diniz and Bastos (1974), and Mori and Prance (1990b). Brazil nuts are cultivated in tropical botanical gardens far outside its native range, and minor plantations have been established in Kuala Lumpur in Malaysia (Müller, 1981) and Ghana in Africa (D.K. Abbiw, pers. comm.). Trees of Bertholletia excelsa occur in stands of 50 to 100 individuals that are known as "manchales" in Peru (Sánchez, 1973) and "castanhais" in Brazil (Dias, 1959). Density of Brazil nut trees per hectare varies considerably throughout the Amazon. In a study of Brazil nut production in eastern Brazil, Miller (1990) found from 9 to 26 reproductive trees per hectare, while Becker and Mori (unpublished data) found only one tree over 10 centimeters dbh in a 100-hectare plot in central Amazonian Brazil. There is some evidence that Brazil nut trees are gap dependent (Mori and Prance, 1990b). Moreover some authors have suggested that stands of the Brazil nut owe their origin to pre-Colombian Indians (Miller, 1990; Mori and Prance, 1990b; Müller et al., 1980). An understanding of the development of reproductive individuals from seed is still needed before management of Brazil nuts in natural stands is possible. Fruit development takes longer in B. excelsa than in any other species of Lecythidaceae. Moritz (1984) states that 15 months are needed for the fruits to develop after they have been set. Consequently, Brazil nut fruits fall mostly in January and February, during the rainy season. Under natural conditions, the seeds take 12 to 18 months to germinate (Müller, 1981). The flowers of the Brazil nut are zygomorphic, with an androecium that is prolonged on one side into a hood that arches over and is tightly appressed to the summit of the ovary. In addition, the petals are appressed to the androecium (Fig. 27-1). Consequently, the flowers can only be entered by large-bodied bees with enough strength to pry open the androecial hood to obtain the pollinator reward that is thought to be nectar produced at the apex of the coiled androecial hood. Bees of the genera Bombus, Centris, Epicharis, Eulaema, and Xylocopa have been captured visiting Brazil nut trees (Moritz, 1984; Müller et al., 1980; Nelson et al., 1985). These bees are nonsocial or semi-social and therefore do not lend themselves easily to manipulation by humans, such as is the case with the social bees (for example, Apis, Melipona, and Trigona) that can be used to pollinate certain crops by transporting beehives from one plantation to the next. For the most part, cross-pollination is needed for seed set in Neotropical Lecythidaceae. Therefore, the bees, and to a lesser extent bats, are essential for the pollination and subsequent fruit and seed development of Lecythidaceae. 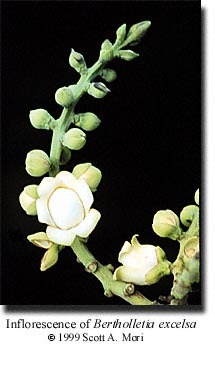 Although a low level of in-breeding may occur in Bertholletia excelsa, most seed set in this species is the result of cross-pollination (Mori and Prance, 1990b). The development of self-compatible lines of the Brazil nut would facilitate plantation cultivation of this species by eliminating the need for cross-pollination by the difficult to manage bee pollinators. 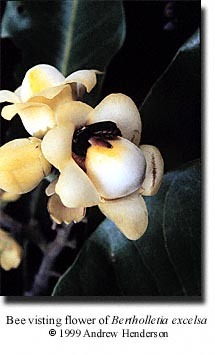 Bees outside of the native range of the Brazil nut can effect pollination. For example, Brazil nut trees in Ceylon (Macmillan, 1935), Kuala Lumpur, and Ghana set fruit. However, it is not known if pollinators outside of the native range of the Brazil nut or "weedy" pollinators found in secondary forests are efficient enough to allow for economically viable fruit production. The fruits and seeds of B. excelsa are unique in the Lecythidaceae. At maturity the large, round, woody fruits fall to the ground with the seeds inside. The seeds, which have a bony testa, are removed from the capsules and dispersed by rodents, especially agoutis (Dasyprocta spp.) (Huber, 1910; Miller; 1990; E. Ortiz, pers. comm.). Agoutis and squirrels may be the only animals able to efficiently gnaw through the extremely woody pericarps. They eat some of the seeds and cache others for subsequent use. Consequently, the seeds are either eaten and destroyed or they are left in a forgotten cache where they may eventually germinate 12 to 18 months later. Brazil nuts are harvested almost entirely from wild trees during a five to six month period in the rainy season. The fruits, which weigh from 0.5 to 2.5 kilograms and contain 10 to 25 seeds, are gathered immediately after they fall in order to minimize insect and fungal attack of the seeds, and to control the number of seeds carried away by animals (Mori and Prance, 1990b). According to Miller (1990), the number of capsules produced per tree ranges from 63 to 216. More detailed descriptions of the methods of Brazil nut harvest can be found in Almeida (1963), Mori and Prance (1990b), and Souza (1963). Collection of Brazil nuts has a major impact on local Amazonian economies. Available figures, however, only provide approximations of total production because of the difficulty in obtaining accurate data from the Amazon. Brazilian production has ranged from 3,557 tons in 1944 to 104,487 tons in 1970. Since 1980, annual production has been around 40,000 tons (Mori and Prance, 1990b). In the past, the welfare of many Amazonian towns, such as Puerto Maldonado, Peru (Sánchez, 1973) and Marabá, Brazil (Dias, 1959) depended heavily on Brazil nut production. In 1986, the total value of shelled and unshelled Brazil nut seeds exported from Manaus alone was $5,773,228. (Mori and Prance, 1990b). Most of the seeds are sent to England, France, the United States, and Germany. Calculations by Miller (1990) have estimated the primary value (money paid to the collectors) of Brazil nut stands to be $97 per hectare. This value includes an arbitrary 25 percent discount to allow for seeds left in the stands. The secondary value --- in other words, the money received by the exporting company for unshelled nuts by a United States based importing company---was estimated at $175.56 per hectare. The tertiary value---the cost of a bag of unshelled nuts in a Florida supermarket---was calculated at $1059.44 per hectare. Shelled and processed nuts are much more valuable. Efforts, such as those by Cultural Survival, to place some of the shelling and some of the processing in the communities of the collectors provide additional incentive for maintaining extractive reserves. Over a ten year period, utilization of a forest for Brazil nut production appears to be more profitable than extracting timber or cutting the forest for pasture (Miller, 1990). Brazil Nut Plantations The methodology for growing Brazil nuts in large plantations has been developed by Müller and his associates of CPATU, Belém, Brazil. An English summary of their work is provided by Mori and Prance (1990b). 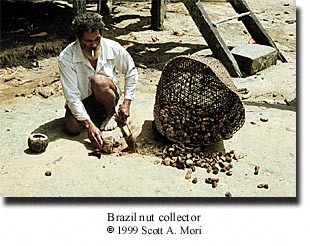 As mentioned previously, most Brazil nut production is still gathered from wild trees. However, plantations are being developed in various parts of the amazon. In January 1990, I visited Fazenda Aruanã, a Brazil nut plantation located at kilometer 215 on the Manaus/Itacoatiara Road in Amazonas State, Brazil. This is a 12,000 hectare former cattle ranch partially converted to Brazil nut plantation in 1980. At the time of my visit, 318,660 Brazil nut trees were planted on 3,341 hectares. In addition, there were an unknown number of individuals growing in nearby forests belonging to Fazenda Aruanã. The original intent at Fazenda Aruanà was to plant Brazil nut trees in 20 by 20 meter grids and allow cattle grazing between the trees. At first the cattle did not eat the leaves of the trees, but later they did. As a result, the spacing was reduced to 10 by 10 meter rids and the number of cattle was reduced to 300 head. The trees in the Aruanã plantation are the result of grafting high yielding clones from the region of Abufari Amazonas where Brazil nuts are known for their large fruits and seeds. An important consideration in the establishment of this and other plantations is the provenance of the seed. Moritz (1984) has shown that fruit production as the result of fertilization between trees of the same clone is low. Based on this concept, Müller (1981) recommends that buds for grafting should be obtained from at least five different trees. A danger in using so few clones for grafting is that selecting for high fruit yield may also reduce the plantation's ability to resist future attacks of disease and insects. Root stock is grown in Fazenda Aruanã from seed. The seeds are germinated by softening them in moist sand and subsequently removing the embryo by opening the seed coat along its edges. The embryos, which are treated with a fungicide, germinate in approximately 20 days and the seedlings are grown in plastic bags or cups. When the seedlings are transplanted to the field, about 200 grams of phosphorous is added to the hole in which they are planted. Root stock is ready for grafting at about 1.5 to 2 years when the young trees have become well established in the field. Better scions are obtained if the leaves are removed from the branches 8 to 10 days before the scion is removed. This promotes the formation of vigorous buds that take better to grafting. Thirty days after the graft has been made, the root stock is ringed distally to the graft. This allows the scion to gradually outgrow the branches of the root stock. After six years, the trees begin to produce fruit. However, at the time of my visit all fruit produced until then had been used to grow more root stock or to produce seedlings for sale to others. The plantation does not appear to have problems resulting from the lack of pollinators. Bixa orellana had been planted to provide pollen as a food source for pollinators. Moreover there is extensive natural forest surrounding the plantation and windrows with natural vegetation transect the plantation. The windrows harbor numerous plants known to be food sources for the pollinators of Brazil nut trees. Although the trees were nearly 10 years old at the time, there was no evidence or history of disease. The owners of Fazenda Aruanà have great expectations for this plantation. At the end of 12 years, they expect yields of 4.8 kilograms per tree and $480 per hectare. At the end of 18 years, they predict 8.5 kilograms per tree and $850 per hectare. Future of Brazil Nut Production Until now Brazil nuts have been gathered mostly from wild trees. In recent years, Brazil nut production has declined because of deforestation, the exodus of Brazil nut gatherers to large metropolitan centers, the flooding of some traditional Brazil nut stands, and perhaps because of disruption of pollinators caused by fires during the dry season when Brazil nut trees are in flower (Kitamura and Müller, 1984; Mori and Prance, 1990b). If traditional methods of Brazil nut production are to be maintained, very large extractive reserves will have to be established in areas of high Brazil nut tree density. However, those interested in the preservation of tropical nature should be careful not to equate the establishment of extractive reserves with the maintenance of Amazonian biodiversity. Because Brazil nut gatherers and rubber tappers do more than just gather Brazil nuts, they often have a negative impact on plant and animal diversity. Indeed, extractive reserves may become little more than secondary vegetation with economic plants such as Brazil nut and rubber trees scattered here and there. Therefore, the establishment of extractive reserves does not negate the need for well planned biological reserves. The future success of Brazil nut plantations is still open to debate. Until now, there have been no examples of economically successful plantations of this Amazonian tree. All attempts at growing tropical trees in plantations that do not naturally grow in nearly monotypic stands have been failures. In their native habitat, Brazil nut trees are distributed more or less scattered in the forest in much the same way that rubber trees grow. The economic disaster of attempting to bring rubber into plantations within its home range has been well documented (Hecht and Cockburn, 1989), and there is no reason to believe that Brazil nut plantations in Amazonia will not meet the same fate as the Amazonian rubber plantations. Careful observation of the Aruanã Plantation over the next decade may allow us to determine if Brazil nut production in plantations is a viable alternative to collection from wild trees. If plantations are viable, then conservationists will have to be prepared to assess the impact that plantations will have on the maintenance of extractive reserves. Finally, it is important that we do not place too much hope on Brazil nut extraction as an economically viable way to support an ever increasing population in Amazonia. In the first place, world markets may not be able to handle much of an increase in Brazil nut production, and, in the second place, such low intensity use of land is not capable of supporting human populations at the level needed to increase the standard of living demanded by more and more people. If Ewel's (1991) estimates that hunting-gathering and shifting agriculture can only support one person per 5 square kilometers and one person per square kilometer, respectively, are correct (there is no reason to believe they are not), then extractive reserves will do little to absorb population growth in Amazonian countries. The future of extractive reserves and humanity's ability to preserve a representative sample of Neotropical biodiversity depends on the success of controlling population growth and consumption both inside and outside of the tropics (Erhlich and Erhlich, 1990). de Almeida, C.P. 1963. Castanha do Para: Sua exportação e importância na economia Amazonica. Edições S.I.A. Estudos Brasileiros 19:1-86. Balick, M.J. 1985. Useful Plants of Amazonia: A Resource of Global Importance. In G.T. Prance and T.E. Lovejoy (eds. ), Amazonia. New York: Pergamon Press. Dias, C.V. 1959. Aspectos geográficos do comércio da castanha no médio Tocantins. Revista Brasil. Geogr. 21(4):77-91. Dickson, J.D. 1969. Notes on Hair and Nail Loss after Ingesting Sapucaia Nuts (Lecythis elliptica). Econ. Bot. 23:133-34.
de Diniz, T.D., A. S. Diniz, and T. X. Bastos. 1974. Contribuição ao conhecimento do clima tipico da castanha do Brasil. Bol. Técn. IPEAN 64:59-71. Ewel, J. 1991. Conservation and Agriculture. Tropinet 2(1):1. Ehrlich, A.H., and P.R. Ehrlich. 1990. Extinction: Life in Peril. In S. Head and R. Heinzman (eds. ), Lessons of the Rainforest. San Francisco: Sierra Club Books. Farnsworth, N.R. 1984. How Can the Well Be Dry When It is Filled with Water? Econ. Bot. 38:4-13. Hecht, S., and A. Cockburn. 1989. The Fate of the Forest. New York: Verso. Huber, J. 1910. Mattas e madeiras amazônicas. Bol. Mus. Paraense Hist. Nat. 6:91-225. Kerdel-Vegas, F. 1966. The Depilatory and Cytotoxic Action of Coco De Mono (Lecythis ollaria) and Its Relationship to Chronic Seleniosis. Econ. Bot. 20:187-95. Kitamura, P.C., and C.H. Müller. 1984. Castanhais nativas de Marabá-PA: Fatores de depredação e bases para a sua preservação. EMBRAPA, Centro de Pesquisa Agropecuária do Trópico Umido. Documentos 30:1-32. Macmillan, H.F. 1935. Tropical Planting and Gardening with Special Reference to Ceylon. London: Macmillan. Menezes, M.A. 1990. (Reservas extrativistas: Por uma reforma agrária ecológica.) Ciência Hoje 11(64):4-6. Miller, C. 1990. Natural History, Economic Botany, and Germplasm Conservation of the Brazil Nut Tree (Bertholletia excelsa Humb. and Bonpl). Masters thesis presented at the University of Florida. Mori, S. A., and G.T. Prance. 1990a. Lecythidaceae--Part II. The Zygomorphic-Flowered New World Genera (Bertholletia, Corythophora, Couratari, Couroupita, Eschweilera, and Lecythis). Fl. Neotrop. Monogr. 21(II): 1-376. Mori, S. A., and G.T. Prance. 1990b. Taxonomy, Ecology, and Economic Botany of the Brazil nut (Bertholletia excelsa Humb. and Bonpl. : Lecythidaceae). Adv. Econ. Bot. 8:130-50. Moritz, A. 1984. Estudos biológicos da castanha-do-Brasil (Bertholletia excelsa H.B.K.). EMBRAPA, Centro de Pesquisa Agropecuária do Trópico Umido. Documentos 29:1-82. Müller, C. H. 1981. Castanha-do-Brasil; estudos agronômicos. EMBRAPA, Centro de Pesquisa Agropecuária do Trópico Umido. Documentos 2: 1-25. Müller, C. H., I. A. Rodriques, A. A. Müller, and N.R.M. Müller. 1980. Castanha-do-Brasil. Resultados de pesquisa. EMBRAPA, Centro de Pesquisa Agropecuária do Trópico Umido. Miscelânea 2:1-25. Nelson, B. W., M. L. Absy, E. M. Barbosa, and G. T. Prance. 1985. Observations on Flower Visitors to Bertholletia excelsa H.B.K. and Couratari tenuicarpa A. C. Sm. (Lecythidaceae). Acta Amazônia 15 (1/2):225-34. Peters, C.M., A. H. Gentry, and R.O. Mendelsohn. 1989. Valuation of an Amazonian Rainforest. Nature 339:655-56. Prance, G.T., and S.A. Mori. 1979. Lecythidaceae--Part I. The Actinomorphic-Flowered New World Lecythidaceae (Asteranthos, Gustavia, Grias, Allantoma, and Cariniana). Fl. Neotrop. Monogr. 21(1):1-270. Sánchez. 1973, Explotación y comercialización de la castaña en Madre de Dios. Ministerio de Agricultura, Dirección General de Forestal y Caza, Informe No. 20. Lima, Peru. Souza A. H. 1963. Castanha do Pará: Estudo botánico químico e tecnológico. Ediçoes S.I.A., Estudos Técnicos 23:1-69. Vaz Pereira, I.C., and S.L. Lima Costa. 1981. Bibliografia de Castanha-do-Pará (Bertholletia excelsa H.B.K.). EMPRAPA, Centro de Pesquisa Agropecuária do Trópico Umido. Belém, Pará.